No matter what your ailment, the vast majority of your recovery is dependent on your body healing itself. Stretching can help play an important role in the healing process and provides many benefits to the body, but only if it's done at the correct stage of the healing process, and can be harmful if the correct method is not used when performing a stretch. In general, stretching can help to improve circulation throughout our body and also helps give the body better range of motion and flexibility. BFST® (Blood Flow Stimulation Therapy™) wraps can also provide these benefits, without the risk of re-injury or damage that comes with stretching. After stretching, the best way to cool down and reduce hyperextension is with a ColdCure® compression wrap. The benefits of stretching are truly remarkable. Below we attempt to explain when stretching should be used and when to avoid stretching in very simple terms. Understanding when to stretch in conjunction with the healing process is very important for the body to properly heal itself. We hope this understanding will help you in your personal care and help you heal stronger and more quickly. The main body frame is made up of 600+ muscles which give us range of motion and maintain posture; they are designed to contract and expand with the movement of our body. Stretching is primarily used to help improve flexibility and circulation throughout different muscles. Stretching for flexibility will help give better range of motion and help prevent pulling and/or tearing of muscles with body movements. Stretching for circulation will help improve the overall durability and muscle performance, warming up before physical activity helps improve circulation which in turn helps your muscles preform at a higher efficiency during physical activity. When a muscle gets a tear, inflammation will usually set in within a matter of minutes. This is the time for rest and cold treatment therapy. Stretching is not advised at this time. After the inflammation has settled it's time to begin the healing process. Stretching is not recommended in the early stages of the healing process, as it can further irritate the tear and possibly lead to a more severe injury. It's good to rest the muscle as much as possible throughout first couple stages of the healing process, then light stretching will help provide some extra circulation which in turn will aid the healing process. Tendons are what connect our muscles to our bones, they do have flexibility and can be mildly stretched. However, stretching Tendons is not recommended. 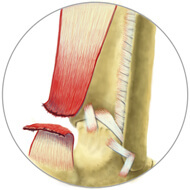 Tendons tend to get inflamed with repetitive motion and/or stretching, which can lead to tendonitis. Tendonitis is treated with rest and cold compression, with initial recovery in 4-7 days and full recovery within 6-8 weeks. Mild stretching after a full recovery can be useful, but stretch with caution as this could lead to further aggravation/injury if the tendon is overstretched. Our ligaments connect our bones to other bones. They provide our joints with stability and limit our joints to a certain range of motion. In general ligaments are not meant to stretch. 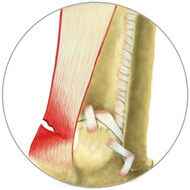 If a ligament is overstretched it will not retain its original shape. A tear in the ligament needs to have rest and ice applied for the first few weeks. Ligament injury's are serious and must not be stretched what so ever. It's important to know the severity of your injury before you stretch. Stretching can play a vital role in the healing process. As discussed on this page it's important to understand your injury and the stages of the healing process before you begin any stretching. Listed below are the different tear types with recommendations on stretching. Grade 1 Tear. Slight feeling of pain which can be associated with tightness and cramping. In general very easy to manage, stretching is recommended after initial recovery. Grade 2 Tear. Immediate pain which is followed by swelling just minutes later. A few weeks of rest is needed for the healing process to begin. Use caution if you want to stretch, the tear must complete the first 2 stages of the healing process. Grade 3 Tear. Serious damage to all fibers and tissue with major loss of function, surgery may be required. Treat with lots of rest and cold therapy for the first few weeks. Expected recovery can be 8 to 12 months with no recurring injury. Stretching is not advised within the first 4 to 6 months of the healing process. Above we discussed stretching and key times to stretch. As we just presented it, there is a clear path from getting injured to getting better. Though for many people, their injury never seems to heal. This is because in reality we don't just injure ourselves once. After the first injury we constantly re-injure ourselves and this process stops us from getting better. The main cause is stretching at the incorrect time in the healing process. You need to rest the injury first. People almost never let their body heal. Sometimes people have no choice, sometimes people just don't know any better. When you are injured, your body has to go through the healing process. There is no short-cut. Regardless, people tend to overstrain their injury by performing incorrect stretching before it has healed sufficiently and they constantly re-injure themselves. You have re-injured yourself every time you feel that 'pain'. You stretch that certain way and feel it or perhaps you just go about life and the pain creeps back. Every time you feel pain it's because you've undone some of the healing process. Every time you stretch and feel pain it's because you've broken the membrane or torn the Type 1 or Type 2 tissue and your body has to start the healing process for that tissue all over again. If you injure yourself badly enough each time or often enough, the amount of damage you do completely undoes the healing your body has done and you never get better. For people who never give their body a chance, the injury just keeps getting worse. Rest first, stretch later! Please take time to understand the healing process in conjunction with stretching that we have described. At different stages your body may have only regained 10% or 20% or 50% of its former strength (This is no time to stretch). If you push your body beyond that limit, you're going to tear the tissue open again and reset the healing process back to stage 1. 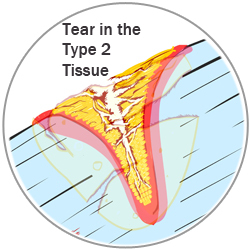 The pain is usually gone during stage 2 when only the Type 1 tissue is in place. You may only have regained 20% or 30% of the strength even though 100% of the pain is gone. If you're taking pain killers, your pain may be gone but your tissue strength is only at 10% or 15%. The problem isn't that your body isn't healing. The problem is that you are re-injuring the area again and again and again by stretching too early. This has to stop if you want to get better. For the period of time after being injured until you fully heal, BFST® wraps offer the option to improve blood flow and accelerate your healing proccess without the problem of stressing injured tissue that stretching eperiences. For the best stretching results, the BFST® (Blood Flow Stimulation Therapy™) wrap aids in improving blood flow as well as increasing your level of flexibility. Better blood flow with BFST® means faster healing, getting you back to your healthy self in much less time. The BFST® device works by stimulating blood flow and lymphatic activity in the healing tissue. Proper circulation is essential to the growth of new tissue. 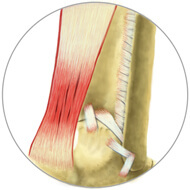 When you're injured and idle though, the circulation in injured tissue is limited. By using regular BFST® treatments you can stimulate the blood flow to your Type 1 and Type 2 and final replacement tissue. This can help it to regrow as quickly and healthy as possible. The healing / re-injury process is almost inevitable. The important thing is to heal as much as you can in between re-injury. You want to minimize the time it takes to heal and minimize the amount of permanent damage left to the surrounding tissue. Remember, long after the pain goes away, the healing process continues. BFST® treatments should be continued for the entire healing period if you want to regain the maximum amount of strength in the minimum amount of time. How well you heal and how quickly you heal is up to you. 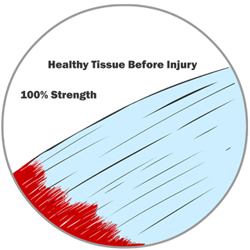 How you treat your wounded tissue matters. After stretching, you need to cool down to avoid making your injury worse. ColdCure wraps help by reducing pain and inflammation, providing a drug-free way to protect yourself from further injuries or hyperextension. 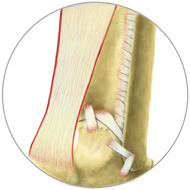 ColdCure® also provides one of the best treatments for tendonitis injuries, which stretching does not help. The ColdCure® wraps have 2 valuable functions. First, immediately after injury, and again after every re-injury, your body has to stop new bleeding and tissue damage. 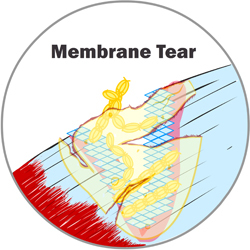 New membranes form around the newly damaged tissue. ColdCure® wraps help this process by causing the circulatory pathways to contract and reduce flow. This makes it easier for membranes to form and cover/seal the leaks. Both the cold and the compression of the wrap provide this benefit. Many injuries and re-injuries are very painful. A ColdCure® wrap is an excellent way to treat the pain quickly and effectively. The effectiveness of these devices at relieving pain amazes most people the first time they use them. Many people find them much more effective and faster acting than pain killers. Treatment wise, they are a much better choice because most pain killers can actually interfere with the first stage of the healing process. By 'thinning' the blood, traditional pain killers thwart the membrane containment process. What's worse is that drugs can mask the injury and lead to a false sense of ability, causing people to re-injure themselves again. If your injury has ongoing pain and swelling, ColdCure® is an excellent therapeutic choice.